I realize that it's soccer. I realize that it's women's sports. And I realize that it only counts as one medal. But what has transpired with the United States women's soccer team, not only during the 2012 Summer Olympics in London but in last year's World Cup as well, has been nothing short of amazing. After a heartbreaking loss to Japan in the 2011 World Cup final, the Americans vowed redemption in the Olympics. 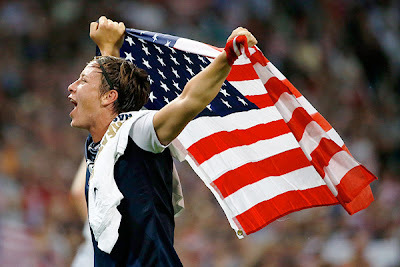 Stars such as Abby Wambach even alluded to the fact that it would be "gold or bust" for her team in London. Personally, I believe Japan won the World Cup final outright, instead of the Americans giving it away. The Japanese team's heart and soul, Sawa, was just too much for the Americans to handle as she dominated possession in the midfield. With that being said, I wanted to "hate" on two things concerning this game in particular and American soccer as a whole. First, the reactions a large number of Americans had in regards to the outcome of the game was extremely disappointing and embarrassing. The country of Japan was in the midst of going through one of the most horrific tragedies the world has ever seen (earthquake, tsunami, & nuclear meltdown). Unfortunately, the lack of tactfulness and compassion really came through in social media outlets such as Facebook and Twitter immediately after the conclusion of the game. "We may have lost in soccer, but we won in World War II." "So Japan won the World Cup. Its okay, we still have Hiroshima." "I hope another tsunami hits them." Secondly, we have grown increasingly fickle when it comes to fandom. I am guilty of this. With 24/7 sports news cycles like ESPN and Fox Sports, the internet, and the millions of blogs, we've become prisoners of the moment when it comes to sports. It was really exciting witnessing the country unite as the Americans played well enough to earn a spot in the finals. But as soon as that game ended in a loss, it was like nobody cared anymore. What happened to supporting your team (and country) through thick and thin? Fast forward to 2012 and you can't script it any better than this. The United States and Japan are meeting again, only one year after the World Cup final -- this time for the gold medal. The Americans played in arguably one of the most memorable women's soccer game in the history of the sport to earn a spot in the gold medal game. Heading into the semifinals, Canada was the clear underdog, having never held a lead against the Americans... ever. But that quickly changed after they went ahead 1-0 early in the game, and it was held until the second half when the U.S. tied it off a Rapinoe corner kick / shot. They subsequently went ahead again 2-1 and 3-2, but relinquished their lead each time with the last one coming off a controversial call that led to an indirect free kick in the box which led to a hand ball which led to a penalty kick. Yes, that really happened. When the game went into overtime, the Canadians must have felt that nothing could go their way -- Christine Sinclair provided the scoring with a once-in-a-lifetime performance and the defenders were dictating the game with their ultra-aggressive play, but it simply was not enough. When Alex Morgan, who was getting dominated all day by the Canadians' physical play, somehow got her head on a corner kick, you knew it was just destiny. And that is the brilliance of sports as a whole -- there is such a fine line between being a winner and a loser. The Americans now have to find a way to mentally and physically recover from such a demanding game against Canada and get prepared for their arch nemesis, Japan. It would be a great sense of redemption if they are able to pull out a victory. This is the same team that beat them last year in the World Cup final that left the Americans in tears. This is the same team that took care of Brazil and France with ease leading up to the gold medal match. This is the same team that has only given up 2 goals during the entire Olympic Games. This is the same team that beat the Canadian team that the U.S. struggled with 2-0. 1st minute: With over 85,000 fans at Wembley, the crowd noise and electricity can be felt through the TV screen. 16th minute: The U.S. quickly went ahead on a beautiful cross by Alex Morgan. 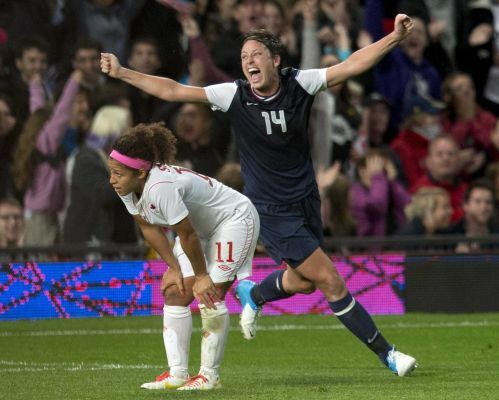 Both Lloyd and Wambach were there and either of them could have scored. A big mistake for not having a body constantly marking Abby. 26th minute: The Americans got away with a handball in the box. The German referee wanted no part of the Japanese coach. 27th minute: Japan almost scored an own goal, hitting the side post while trying to clear a cross. Wow. 34th minute: Another shot that hits the crossbar for the Japanese. 45th minute: The first half is over. Japan has had a multitude of scoring chances and the U.S. back line looked somewhat shaky but the Americans are up 1-0 and that's all that matters. 52nd minute: It's been helter-skelter so far in the beginning of the second half. No real flow. It looks like the U.S. is going to pack it in and take advantage of counter attacks when they arise. Can Hope Solo hold up? 53rd minute: Just as I typed that, the Americans go on a perfect counter which culminated in a beautiful shot by Carli Lloyd. 2-0. Let's go!! 57th minute: My favorite American soccer player (including both male and female), Megan Rapinoe, is subbed out for defensive minded, Lauren Cheney. 33 minutes to go! 62nd minute: Goal for Japan. The American defense is looking horrible. We need to change the alignment. It's not working. The Japanese are making free runs. 82nd minute: WHAT A SAVE Hope Solo!! Her diving save preserves a 2-1 lead. 90th minute: Two more minutes of stoppage time. The anticipation is unbearable! Great job, Japan. World champions in 2011. Silver medalists in 2012. They should be proud. Congratulations USA!! Gold for the US!! America the Beautiful!! How sweet it is! Redemption! We are the champions. But I love me some Alex Morgan! Japan is so gracious in defeat. Great champions. hand ball calls are always tricky the best thing to do is just make sure your arm doesn't touch the ball. Isn't the USA's fault for put the refs in that position.